Quebrada Grande is a fairly large village about five paved miles from Tilaran on the road to Monteverde. It's near the top of the coastal side of the hills and has very nice territorial views. There are steep valleys near it and cattle grazing all about, including near the streams way at the bottoms of the valleys or "quebradas." A few miles farther along the road is the amazing succession of waterfalls known as Vientos Frescos. The village has a central park, a community center, a couple of bars and a small grocery or two. It's an area where you can enjoy the country views, the modest rainfall, and the sunsets that color the surrounding hills. 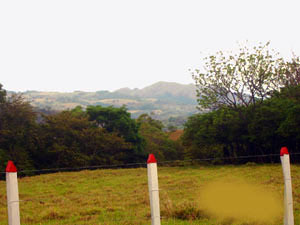 There are Tico homes for sale, a popular highway-side bar with cabins, and now a small gated community with lots for sale. 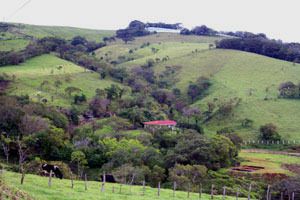 This Quebrada Grande farm has not only pasture and forest but also a crop growing under plastic on a hilltop. 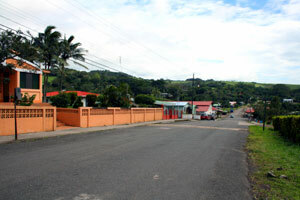 The entrance into town is from the road between Tilaran and Monteverde. The village is fairly large. 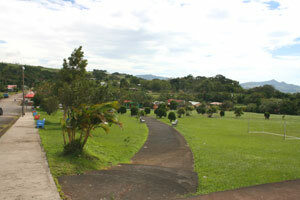 The central park is opposite the community center. 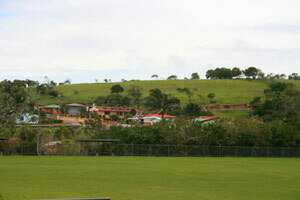 The main part of the village is across the soccer field. West of the village, the complex hills descend to the coastal lowlands. Homes often have distant mountain and sunset views. A8 86-acre working ranch with 360-degree views, including lake, volcano - $1,500,000. Rancher will sell 1 to 4 hectares separately at $150,000 per hectare (2.471 acres). Highly negotiable.